By ShowChrome Accessories. 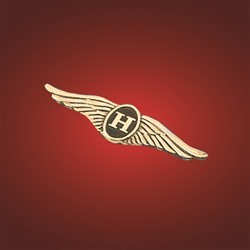 This embossed metal H-wing emblem adds a nice extra touch to various places on your Honda, including yourmud flap. Secures with double sided tape provided. For a flat surface, the emblem is 3 inch long, and gold in color.